"As an employment lawyer who has litigated cases for more than 28 years, and mediated cases for more than 15 years, I have read many articles on optimizing the mediation process. I find Amy's words of wisdom to be one of the most spot-on assessments of how to make mediation successful for the participants. Thank you, Amy, for sharing your great ideas!" "Amy's article on Myths and Misconceptions of Negotiation in Mediation is succinct and well-written, highlighting some of the most frequent myths about mediation and negotiation behavior. I found the real-world examples and valid observations about human nature to be particularly helpful in explaining the "realities." 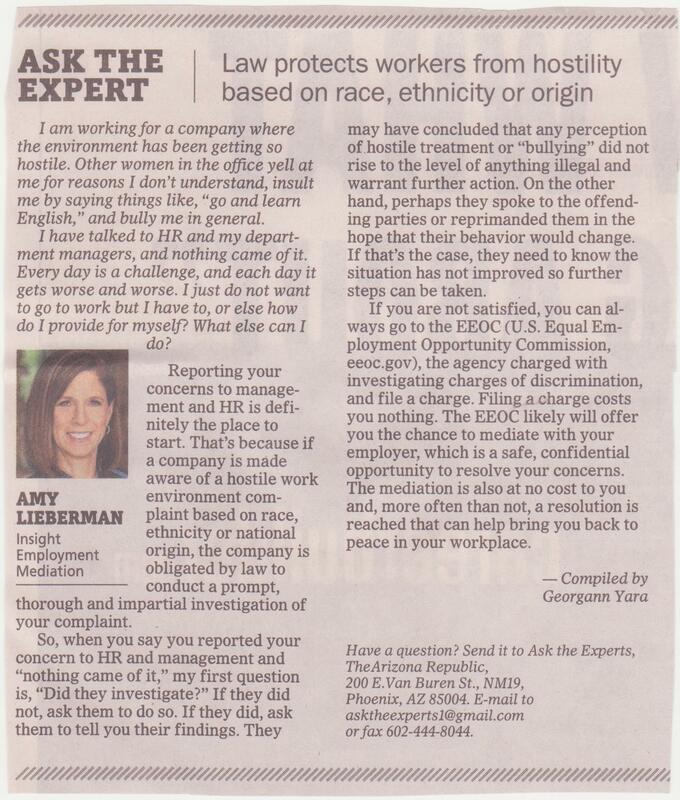 "Thanks for your article in Attorney at Law. Great to see someone pushing the apology to the front line!" Ask the Expert: Can Employer Legally Share Workers' Personal Information? Article on Mediation and Arbitration Produced by Insight Employment Mediation. Amy was interviewed about Mediation in the Workplace, courtroom and business setting by Darra Rayndon on her internet radio show "Money and the Law". Look for the June 23rd show and check it out! How to Use Mediation as an Alternative to a Lawsuit Interview of Amy Lieberman by Jim Blasingame on Small Business Radio, October 2012. Todays Business Woman with Amy Lieberman Interview on MyCity4Her Radio Hosted by Monyka Berrocosa, October 2012.